It’s the A1 Highway. The Kandy Road, or the road to Kandy and nothing can or could ever surpass this ebon highway with its centuries old patched-up macadamized surface now replaced by an elegant carpet of bitumen. The 72-mile stretch to the hill capital weaves its way through hills and dales bends and curves and where to a greater extent passes through the Gampaha and Sabaragamuwa districts to finally merge with the Kandy district at the Kadugannawa rock tunnel. I have traversed this road a thousand times to reach the green grass of home. I have travelled by bus in those far off times when the fare from Colombo to Kandy was only Rupees two. The ride was rough and tiring and would take over four hours to complete. There were frequent stops to cool the engine and pour in buckets and buckets of water down the simmering radiator and one would stand around loosening cramped legs, chaffing at the delay. Yet it was imperative that the engine cooled off. We all knew it and patience was seemingly a virtue thrust on bus travellers of those times. For the record the buses that plied in those far off times were those old time favourite workhorses. The Chevrolets or Chevvies as they were known, the Fords and the Bedfords. The road to Kandy is studded with charming and scenic stopovers some of which have disappeared with road widening. The towns, bazaars and villages, they all have their little secrets and bits and pieces of history tucked away in niches. They also have their industries and sale points. The Radawadunna village and its industrious people have been engaged in the manufacture and sale of cane furniture for ages. Their sales points have a full range of cane crafted furniture though recent reports indicate a sales drop more due to the abundance of plastic and wooden craft. A moment’s stopover would unfold a rare variety of crafted cane products hitherto unknown. The Horagolla village, home to the Bandaranaike dynasty, for who could ever miss Horagolla Walauwa and its sprawling estate and the sanctity it provides with its mausoleum where two of Sri Lanka’s most loved leaders rest undisturbed. Stop a while at Bataleeya and be overwhelmed by those brightly clad seductive cadju belles. The uninitiated like so many others before simply go overboard taken in by their blandishments. I have always thought it to be a kind of unique sales enticement put across with a lot of panache and passed down from one generation to another to be practised in all its finesse for generations to come - on the road to Kandy. In days of yore the stop for refreshments was Warakapola. Not any more. Ambepussa has displaced Warakapola. The Tourist Board eatery and the Rest House perched on a small knoll are two favourite stops. I have always preferred the quiet of the rest house and its quaint colonial facade with its large girthed columns, and old time doors and windows which holds much history within its hoary portals. It was built to house the engineers when the road to Kandy was being built and engineers of the calibre of Major Skinner and Captain Dawson once lived here. Today it oozes typical Sri Lankan hospitality and also serves a finely brewed pot of tea. To bypass Kegalle and its muddled main street of irksome traffic snarls could be excused only to stop at the village of Molagoda and rave over the pottery crafted with precision and where one could browse the shops for hours if given the time, and even wonder how a lump of clay could ever be fashioned into such delightful objects. Wasn’t it John Keyts in his ode to a Grecian Urn who sang that a ‘Thing of beauty is a joy forever’. Molagoda village has all those beautiful objects to make one’s home a joy forever. Uthuwankanda brings vivid memories of our own highway robber, the legendry Sardiel. A stop at a side of the highway to pay a silent tribute to the first Policeman to have died in the cause of duty, shot dead by Saradiel. Driving to reach Ganetenne on a flat track from the Hingula bridge one’s complacency could turn to dismay when taking the sharp left turn heralding the stiff gradient with a stiffer climb ahead - the Kadugannawa Pass on the road to Kandy. With excellent road conditions in place today even three-wheelers take the climb with great ease yet in the years gone by buses and trucks would crawl painfully with radiators steaming and engines whining on high gear. The climb remains and the highway improved and modernized to make driving comfortable. The lush greenery and the scenery below remain unchanged. Yet not so long ago temporary structures doubling as sales outlets marred the exquisite beauty that was the Kadugannawa valley. The litter and destruction was set in motion by local politicians who had no compunction in assisting to destroy nature’s gifts. Today the remnants of this indiscretion still remain confusingly ugly. The rock tunnel was an exciting experience to drive through in those times. The present extension has spoilt it all. Nevertheless the climb remains and further on one could recall in a moment of silence the untimely death of young Ismail who was buried under an avalanche following heavy rain. He was a scion of the much respected Ismail family of Katukelle, Kandy and his distraught parents gifted what is known as the Ismail clock tower situated at the Kandy market square in remembrance of their beloved son. Captain Dawson the intrepid engineer who completed the Kandy road is gratefully remembered. The Dawson tower standing on a cliff at the entrance to the Kadugannawa town is a lasting monument to this great Englishman. It was no easy task in those Victorian times to trace and construct roads and cut through thick jungle, rocks and other obstructions. 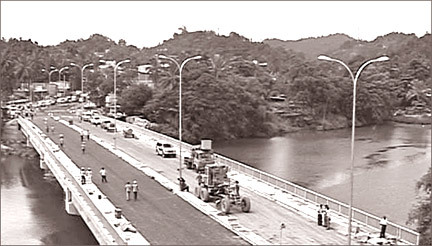 This great achievement was accomplished sans heavy machinery and built on the blood and sweat of those great pioneers, the engineers and the labour, who gifted to prosperity, - The Road to Kandy.